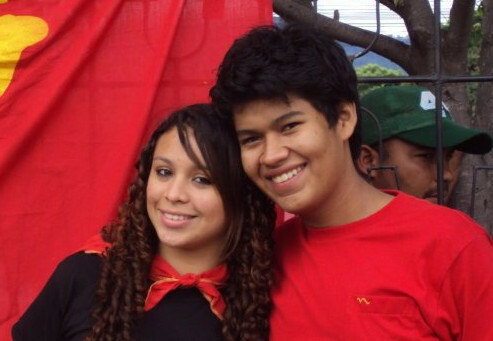 Against the expulsion of Erlin and Kely from the Honduran Pedagogical University! At the end of April, I passed through Tegucigalpa, Honduras and spoke there with Kely Estefanie Nuñez and Erlin Guitierrez. Both are activists of the “Socialist Student Front” (FES), a group that emerged after the military coup in 2009 in the second public university, the National Pedagogical University Francisco Morazan (UPNFM). The FES has been one of the most active groups at the university since then. Assange/Žižek not really all that leftist after-all? Finally got to see the second episode of Julian Assange tv show in which he interviews David Horowitz and Slavoj Žižek. While the interview is certainly original and much better than what western tv has produced for the past few decades, it still seems as if all three take a bunch of conservative premises for granted. Some issues, such as that Latin American leftist leaders are "dictators" as Horowitz claims, are just left unanswered in the room and one can only imagine that Assange/Žižek did not refute such charges as they were simply too far out to be answerable. Wow! My Nicaragua book is listed as a publication by a Norwegian anthropologist in 2011 by the corresponding Norwegian trade association. I thought the Norsk Antropologisk Forening had decided long ago that they wouldn’t touch me with a barge-pole because I’m too dirty/activist. Maybe I should actually sign up and pay member fees. Western media don’t like competition? Can we NOW remove the name of of AP Møller? Danish oligarch Møller has died — and everybody from queen to leader of the social democrats feels the need to say what a great human being he was. Somehow I cannot remember anything similar happening when a labor union leader trying to organize Møller’s company was killed under mysterious circumstances in El Salvador a few years. Møller decided to sponsor a school to the Danish minority in Germany a few years ago. The school association then decided to give it the name of Møller’s father, "A.P. Møller", who had made the company big. Any criticism that Møller had made his fortune in part by selling weapons to the nazis and in more recent years by having an extra-ordinarily good deal on pumping up the Danish oil was swept under the carpet. Now that Møller Jr. is gone, can we maybe get to talk about changing the name of the school again? How much longer do the Danes of northern Germany want to be associated with nazi weapon production? Swung by the Plaza de la Revolución tonight to listen to Daniel Ortega’s interpretation of the Cartagena meeting of American states: He is angry at Canada and USA for voting against Cuban participation in future summits. He believes the governments of those countries don’t really speak for their populations and challenges them to hold referendas to determine what the people really want. He also accused the governments of those countries of thinking they are privileged to determine who is democratic, while repressing the Occupy protests violently. Ah, så flott. da har jeg noe å glede meg til når jeg blir 80! Men hvorfor stoppe med planene der? Hvorfor ikke sette opp en plan om å utvide Oslos trikkesystem til månen rundt år 2334 og til mars i år 3872? "…I Ruters strategidokument er det lagt opp til egne buss- og trikketraseer i indre by fra 2060. …"
To me the writings of Günter Grass look like nothing special. It’s a rehash of things that were known already and opinions that most people in the world would agree with anyway. I don’t see the controversy. Why does this get so much attention just because it comes from a certain person? Are the thoughts of one person so much more important than those of everybody else, no matter how simple they are? Here is the poem translated. OLPC not all that great anyways? I have wondered about this a bit — in a world where a tiny part of the world can potentially produce the electronics for everybody and large parts of the world will never be industrialized (or even deindustrialize) — could it be set up for the underdeveloped parts of the world to develop right into a culture of (coffe drinkin, all-day) web users? Given a socialist, worldwide allocation of resources? Or is this not taking sufficiently into considerations the expectations and cultures of the world? Most certainly OLPC did not consider sufficiently having locals on the ground who could give tech support.